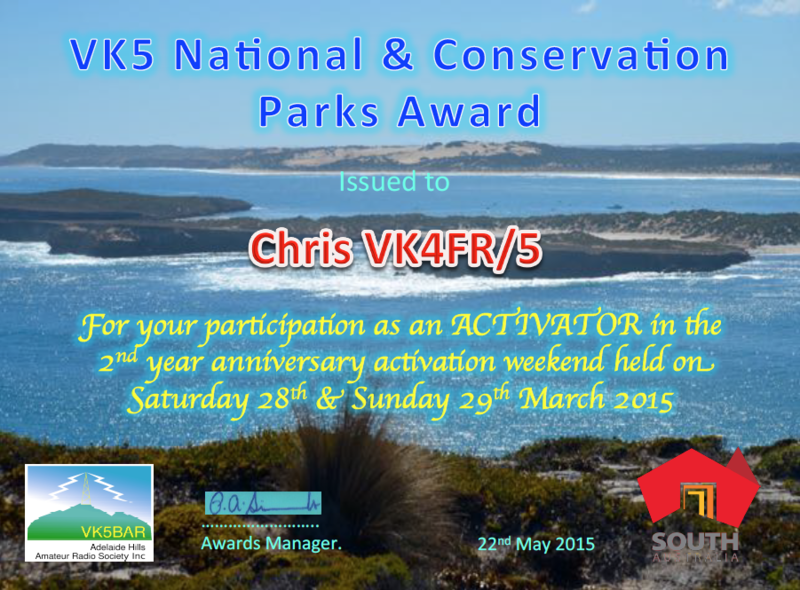 The special activation weekend for the 2nd anniversary of the VK5 National and Conservation Parks Award was held on Saturday the 28th and Sunday the 29th March 2015. I would like to thank all of the park activators and park hunters who participated. There were a total of 111 park activations, and of those, 81 were unique parks. In other words, different parks. A total of 41 activators headed out all across South Australia to activate parks. And South Australia was certainly well represented with activations taking place in the Far North, the South East, the Riverland, the Adelaide Hills, Kangaroo Island, the Adelaide metropolitan area, and the Yorke Peninsula. All up, the activators made over 3,000 QSOs. The activators who took part were Tim VK3MTB/5, Tony VK3VTH/5, Chris VK4FR/5, David VK5AAH, Andy VK5AKH, Tim VK5AV, Doc VK5BUG, Ian VK5CZ, Tom VK5EE, Alan VK5FAJS, Adrian VK5FANA, Gary VK5FGRY, Peter VK5FLEX, Bob VK5FO, Tom VK5FTRG, Norm VK5GI, Greg VK5GJ, Gordon VK5GY, Col VK5HCF, David VK5HDW, Geoff VK5HEL, David VK5KC, Andrew VK5KET, Peter VK5KX, Lesley VK5LOL, Bill VK5MBD, Matt VK5MLB, Andrew VK5MR, Nigel VK5NIG, David VK5NQP, Roy VK5NRG, Keith VK5OQ, Peter VK5PET, Mark VK5QI, Steve VK5SFA, Hans VK5YX, Tony VK5ZAI, Arno VK5ZAR, Greg VK5ZGY, Richard VK5ZRY, and yours truly Paul VK5PAS. Special thanks to Tony VK3VTH and Tim VK3MTB who travelled across the border to conduct multiple activations here in South Australia. Other mentionable efforts include that of Chris VK4FR who travelled to Kangaroo Island and activated multiple parks, and husband and wife time Greg VK5ZFY and Gabbie who activated multiple parks in the South East. There were also some first time park activators including Greg VK5GY and Norm VK5GI who activated parks on the Fleurieu Peninsula, and Roy VK5NRG. I would also like to commend the five Foundation operators who took part as activators. Well done guys, you are certainly leading from the front and a shining example to others. Many of the parks that were activated also qualified for the World Wide Flora and Fauna award with a number of activators taking advantage of the good conditions and working DX on 20m.